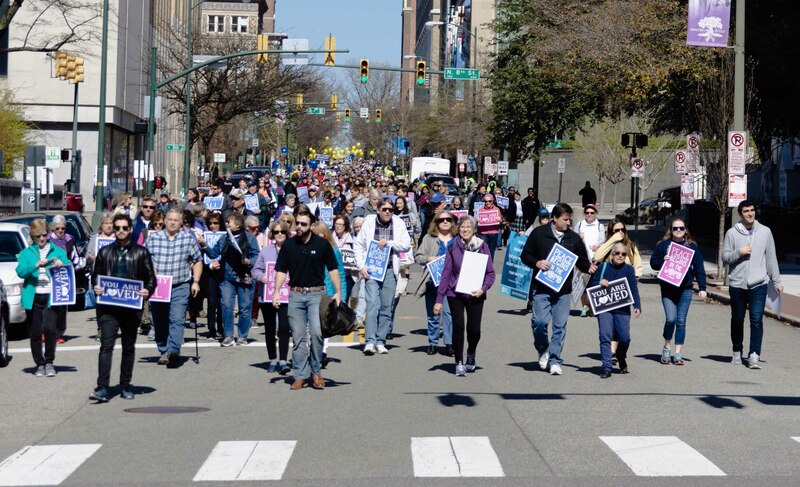 RICHMOND, Va. (CNS) – An estimated 7,000 people, including busloads from the Richmond and Arlington dioceses, converged on the state Capitol in Richmond for the first Virginia March for Life, April 3. On a cool, sunny day, students, mothers pushing infants in strollers, fathers holding their children’s hands, men leaning on canes, priests and nuns gathered to stand up for the dignity of human life from conception to natural death. Bishop Knestout condemned the “callous indifference” Gov. Ralph Northam has shown in his support for abortion rights, and he urged those in the pro-life movement not to lose heart or to respond to the hostility of abortion advocates with hostility of their own. He emphasized the importance of prayer in participants’ witness. “A strong family embraces life; it does not destroy it,” she said. “We must demand that our legislators protect life and conscience rights as we continue our fight against the extreme abortion agenda facing Virginia.” She urged the crowd to become part of the rapid response teams the state Catholic conference is forming to stay on top of such proposed legislation, and to join her during General Assembly sessions to advocate for life. Amy Jo Krystek, a parishioner of St. Andrew the Apostle Church in Chincoteague Island, recognized the many pro-life causes. Amara Davidson of Bishop Sullivan Catholic H.S. in Virginia Beach was one of an estimated 1,100 Catholic school students from around the Richmond Diocese participating in the march. Julie Marquez of York County had plenty of company as she waited for Mass to begin – her daughter-in-law, Martha Marquez, and four grandchildren. Julie Marquez got pregnant when she was 15 and still in high school. Though she knew it would be difficult, she kept the baby. “It’s just sad that now you can abort if you want to and don’t want to deal with the pain,” she said, looking at her 9-month-old son, Mateo. She had a medical problem when she was pregnant with him, a problem that would have led many women to seek an abortion. “You can deliver, baby can survive, mother can be taken care of, and that’s what I want to show and tell my story,” she said. One of the speakers was Jeff Caruso, executive director of the Virginia Catholic Conference. He offered tips on how to navigate the process during Virginia General Assembly’s sessions, telling attendees things move quickly. “To advocate, use email, social media, phone calls and personal visits,” he said.